Matthew - In this study, we've gone back 3.8 million years, but more important than that it's 3.8 million years in equatorial Africa. Previous studies which have found proteins and other molecules far back in time say, for a few million years, they've gone to very cold places - Antarctica, Alaska. But this is in Africa. Chris - The critical point being that the radiation from the sun, the very intense drying environment, the heat. Those things are going to accelerate any protein degradation. So, if you've got something that's 3.8 million years old under those conditions, it's actually going to age a lot more I would presume. Matthew - That's absolutely right. In fact in the lab, what we often do is to heat samples to try and simulate a longer period of exposure and then use those heating experiments to try and guess how far back things will persist. Chris - What will this give us an insight into if you're successful in recovering proteins from various surfaces? Does this tell us where to look? Matthew - Yeah, that's the whole point of this study. We've really broken through a barrier. We didn't think that proteins could survive even in sort of temperate environments like the environments in the UK, more than about a million years. So to go so far back has been a real breakthrough. And then to understand why we've been able to go so far back is the really key part of this paper. Chris - Tell us what you've done. Matthew - So what we did is we went to a range of hominid sites in Africa which have been well dated and we got samples of ostrich egg shell. So, most of these sites have egg shells. We took it as a system to study how the proteins degrade. Chris - So you get these bits of ostrich egg. What did you do to them? Matthew - So what we then did is partially acid etched them, powdered them then we'd leave them bleached for 100 hours to really destroy anything that's on the surface, any contamination. Then we would demineralise them and we'd extract what we could from them which included in fact volatile hydrocarbons. They even smell bad when we started to grind them up - the very old ones - because they were so degraded. When we've done that, we looked for the presence of proteins using a technique known as liquid chromatography mass spectrometry. That method allows us to actually see if there are any constituent sequences still preserved. Chris - The really harsh treatment upfront that is to obliterate anything that might be sticking to it that's more modern than what was originally made when the egg was made. Matthew - That's right because degradation has destroyed most of what was there and it's very easy therefore to contaminate with small parts of modern proteins. So we're really insistent that we had a very clean sample. Matthew - What we found was what the computational chemists have predicted and that was the nice thing because independent of this work and at the same time, a group of scientists at the University of Sheffield were actually modelling how these proteins might interact with mineral surfaces. They had two protein candidates that we gave them, the two most abundant proteins in the egg shell. They had four candidate regions which they thought might survive. The one which, for us, was the most unstable was the one that they predicted will be stabilised when it bounced the mineral surface. From their calculations, they could say that the way that it bounced and the way that was stabilised was going to kind of cooler system by about 30 degrees kelvin. So that part of the protein, they felt will be the one that was going to survive. As we got the data back from the mass spectrometers, what we saw was that the only bit of the egg shell proteins that survived was this one region of the one protein, the one that they had predicted would survive because of its binding to the surface. Chris - Are the proteins that you're seeing, are they in a fit state to be read? We know that a genetic code begets an amino acid sequence which gives you a protein structure so therefore, one can reverse that cycle and say, "Well, if we know what the sequence of amino acid is, we can have a reasonable guess of what the underlying DNA is, but only if the protein's sufficiently intact." Can you do that, do you think? Matthew - Yeah, that's what we've done. 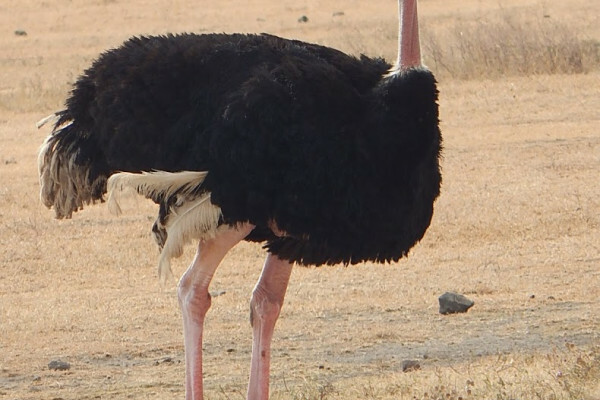 So, we've read the sequence of this ancient ostrich and confirmed that they have the same sequence as a modern ostrich. It wasn't very exciting but the point was we were actually able to get that sequenced information out. Of course, that's the important thing. If we've got the intact sequence, we actually have a reading from the genetic code or be it, a limited sequence. Chris - We're being really speculative here. If you've got back to beyond 3 million years ago, that's a 20th of the way to a T-Rex which is when we last think they existed. What do you think the prospect might be to extrapolating this even further back? Matthew - What we've done in the paper is try to give you a sense of that. What we've done is try to normalise the various temperatures at which various people have found old sequences to a standard 10 degree centigrade cold British climate. At that temperature, those sequences we've looked at now we're surviving about 40 million years, so we're pretty close. And that also implies if we went back even colder, we could get back beyond the 65 million barrier. So yes, but the problem there is, unfortunately, dinosaurs didn't tend to like to live in very cold places. In fact, our Earth was a lot warmer in the past than it is now, both factors which would actually probably preclude recovery of sequence from this type of material.